Is your horse in danger of laminitis? Why a Ground Parallel Coffin Bone? - Is your horse in danger of laminitis? - Why a Ground Parallel Coffin Bone? Carola graduated from a Professional Hoofcare Training Program in 2003 and has built her busy practise to over 200 horses to date. She has dedicated a significant part of her practise to the education of horse owners and therefore help prevent soundness related problems through better awareness and knowledge. Many of her clients have become self sufficient and competent owner-trimmers, some have even become professionals themselves. Through professional networking and offering professional development opportunities, as well as mentoring new students and apprentices of hoof- and healthcare professions, she is part of a small group of qualified hoofcare professionals in Australia who not only have extensive practical experience in the field but also have an in-depth knowledge of Holistic Equine Podiatry which is based on the scientific knowledge of Zoology, Anatomy, Physiology, Histology and practical trimming techniques which are applied with extreme care to fit the individual’s needs. an NRC Plus Graduate (Nutrition/Dr. E. Kellon) and still teaches dressage or judges when there is time. She is an IICT Approved Training Provider, a Level IV Workplace Trainer and Assessor, an official mentor for the ACEHP Training course and – last but not least, the first official AEBM’s (Australian Equine Barefoot Movement Inc.) Education Officer. 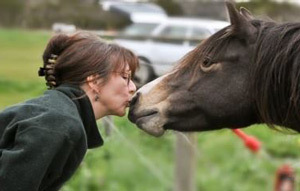 In 2014 Carola took over Equine Soundness and is continuing the school with her incredible knowledge, experience and insight on hoof care as well as her passion for teaching. Audrey, shown here with her horse, Rex, helps Freedom farm running smoothly and the farm horses feeling their best. She has been assisting with the hoof care program at Freedom Farm since 2003. After attending the International Center for Equine Arts in 2004 and earning her certification as an Equine Hoofcare Professional, she began building her clientele, which has now grown to over 100 horses. Rehabilitating lame and unhealthy horses has become a passion for her and she has successfully rehabilitated several horses from chronic lameness problems such as navicular, founder and severe contraction. Audrey enjoys exploring and using holistic methods of health care. As founder of Sound Horse Solutions, she encourages disease and lameness prevention by educating owners about the tools and options available to them. This enables them to be more proactive and make informed decisions regarding their horses’ health care. Carolina’s journey into hoofcare started with Vala, the little Icelandic mare who foundered badly. The conventional world gave no hope for this little girl and Carolina embarked on the journey to learn all about natural horse keeping, feeding, and trimming. 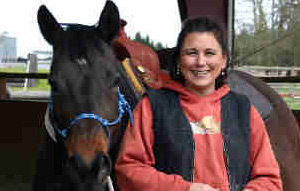 She started to trim her own two horses in 2004, eventually enrolled in the professional course at Equine Soundness and graduated. After graduation she continued her studies to qualify as an instructor at Equine Soundness. Trimming, feeding/nutrition and natural lifestyle are her main interests. She is also eager to learn more about equine dentistry. In 2008 Carolina started veterinary school, from which she graduated with a doctorate in veterinary medicine in 2014. Carolina resides in Norrkoping, Sweden and is available for practical training to students in Europe.